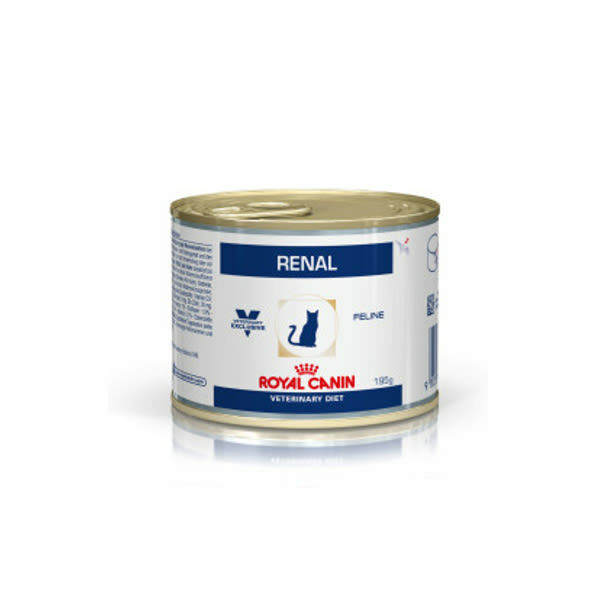 Royal Canin Veterinary Diet Feline Renal is a complete food specially designed to help relieve your cat from the discomfort and risk that kidney problems bring. This veterinary recipe includes ingredients like vitamin D, iron and calcium to provide your cat with the best way of preventing and recovering from kidney problems. The choice of flavours, along with a scent profile, makes sure even the exigent eaters are catered for. 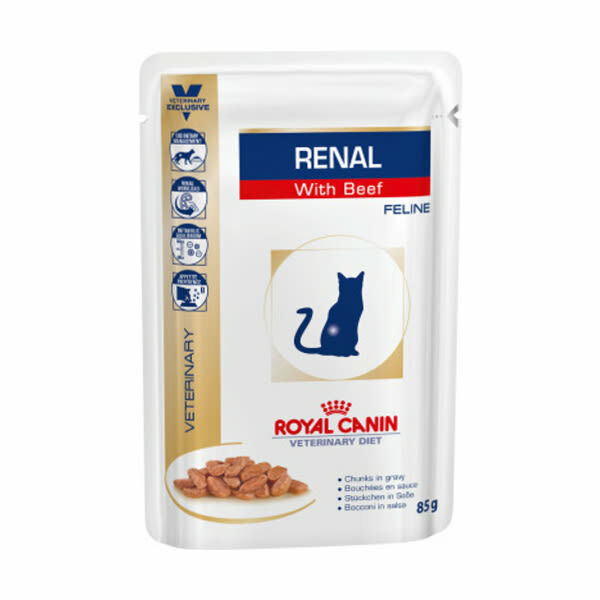 Fatty acids, antioxidants and low phosphorus level help support your cat`s kidneys even if they`re suffering from chronic kidney disease. If your cat has been already diagnosed with kidney disease, give her a little bit of care. Your cat`s kidneys, like ours, are responsible for filtering out harmful substances from their blood. If kidneys develop any issues, it can stop your cat from getting rid of the waste products in its urine, which means that they can build up in its bloodstream and can cause weight loss, dehydration, mouth ulcers or bloody or cloudy urine. Royal Canin Veterinary Diet Feline Renal is a simple way to balance your cat`s diet to compensate for reduced kidney function. 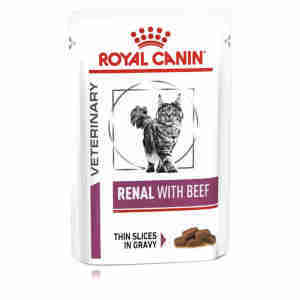 Because veterinary diets are formulated for the nutritional support of pets with specific clinic conditions, Royal Canin recommends that you only use them under professional advice. Meat and animal derivatives (chicken, pork), cereals, fish and fish derivatives (tuna 4%), oils and fats, derivatives of vegetable origin, minerals, various sugars. Protein: 6.6% - Fat content: 6% - Crude ash: 1% - Crude fiber: 1.2% - Moisture: 80% - Calcium: 0.12% - Phosphorus: 0.08% - Potassium: 0.15% - Sodium: 0.08% - Magnesium: 0.015% - Chloride: 0.13% - Sulphur: 0.13% - Vitamin D (total): 400 IU/Kg - Hydroxyproline: 0.07% - Essential fatty acids: 2.02% - EPA and DHA: 0.04%. Urine alkalinizing substances: potassium citrate - calcium carbonate. Nutritional additives: vitamin D3: 240 IU, E1 (Iron): 4 mg, E2 (Iodine): 0.17 mg, E4 (Copper): 1.3 mg, E5 (Manganese): 1.2 mg, E6 (Zinc): 12 mg - Technological additives: Clinoptilolite of sedimentary origin: 0.2 g.
Meat and animal derivatives (chicken 4%,pork), cereals, oils and fats, minerals, derivatives of vegetable origin, various sugars. Protein: 8% - Fat content: 8% - Crude ash: 1.2% - Crude fiber: 0.5% - Moisture: 77% - Calcium: 0.14% - Phosphorus: 0.085% - Potassium: 0.2% - Sodium: 0.11% - Magnesium: 0.015% - Chloride: 0.15% - Sulphur: 0.16% - Vitamin D (total): 450 IU/Kg - Hydroxyproline: 0.08% - Essential Fatty acids: 2.44% - EPA and DHA: 0.05%. Urine alkalinizing substances: potassium citrate - calcium carbonate. Nutritional additives: vitamin D3: 275 IU, E1 (Iron): 4 mg, E2 (Iodine): 0.11 mg, E4 (Copper): 0.9 mg, E5 (Manganese): 1.4 mg, E6 (Zinc): 14 mg - Technological additives: Clinoptilolite of sedimentary origin: 0.2 g.
Meat and animal derivatives (chicken,pork,beef 4%), cereals, oils and fats, minerals, derivatives of vegetable origin, various sugars. Protein: 6.8% - Fat content: 6.6% - Crude ash: 1% - Crude fiber: 0.8% - Moisture: 80% - Calcium: 0.13% - Phosphorus: 0.08% - Potassium: 0.16% - Sodium: 0.1% - Magnesium: 0.01% - Chloride: 0.14% - Sulphur: 0.26% - Vitamin D (total): 350 IU/Kg - Hydroxyproline: 0.1% - Essential fatty acids: 2.33% - EPA and DHA: 0.04%.Urine alkalinizing substances: potassium citrate - calcium carbonate. Nutritional additives: VitaminD3: 230 IU, E1 (Iron): 3 mg, E2 (Iodine): 0.17 mg, E4 (Copper): 1.4 mg, E5 (Manganese): 1 mg, E6 (Zinc): 10 mg - Technological additives: Clinoptilolite of sedimentary origin: 0.2 g.
Good quality and our elderly two cats just about tolerate it - one will eat it readily while the other will only eat it if we sprinkle the Select dry food on it.